Combine at a glamorous night at the casino with an evening tour of Madrid’s top sights. Hop aboard an open-top, double-decker bus to enjoy unobstructed views of Madrid’s palaces and monuments in the soft evening light. Then, spend the rest of the evening at the gaming tables and slot machines of Casino Gran Vía. Try your luck at baccarat, poker, blackjack and roulette, and relax with a drink. Alternatively, upgrade to include a 3-course dinner at the casino restaurant. Make your way to Madrid’s Gran Vía and hop aboard your open-top, double-decker sightseeing bus. Settle aboard, put on headsets to hear the audio commentary, and soak up the 360-degree views as you travel along Route 1 (Blue Route), the circuit around Madrid’s historical districts. Admire top attractions such as Madrid Royal Palace and leafy Paseo del Prado, and pass a host of other landmarks such as Plaza Mayor and Puerta del Sol. After just more than an hour on board the bus, your ride finishes back at Gran Vía. Stretch your legs with a stroll to the nearby Casino Gran Vía. The stunning three-storey venue consists of glamorous, chandelier-lit casino halls and an upscale restaurant with separate Champagne and cocktail bars. Head inside and soak up the decadent atmosphere. Then, depending on the option selected, enjoy a drink or head to the restaurant for a 3-course dinner with wine. 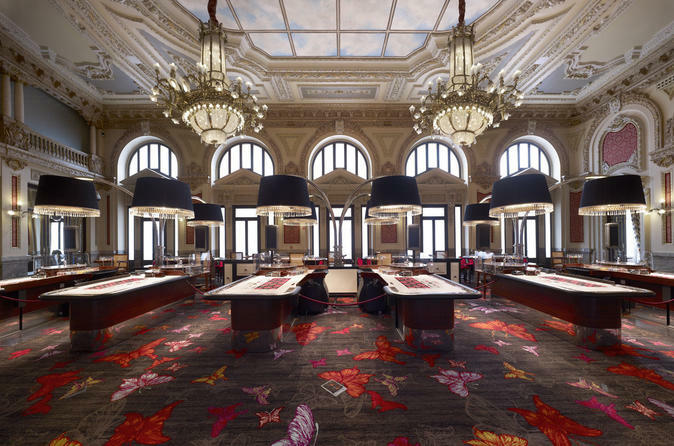 Spend the evening at the baccarat, roulette, blackjack or poker tables, or try your luck at the slot machines; you’re free to join in the fun, however you wish. Stay as long as you wish before the casino closes, early the next morning. See the Itinerary for details of the bus sightseeing route and a sample dinner menu.